Tour of the historic 1910 Arkansas Tuberculosis Sanatorium in Booneville, listed on the National Register of Historic Places in 2006. Booneville (population 4,117) was founded in 1828 in Logan County, Arkansas. Though there is no clear, authenticated record of how the city got its name, a romantic blending of fact and legend offers two different stories. One is that the town was named for Lt. B.L.E. De Bonneville, and the spelling was inadvertently changed. Another tale holds that the city is named in honor of Daniel Boone, since Boone was accompanied on his travels by his cousin, Gen. Benjamin Logan, a member of his family for whom Logan County was named. The Choctaw, Oklahoma and Gulf Railroad was completed from Little Rock through Magazine to Booneville in the late 19th century. The railroad bought land north of the tracks and just northwest of the existing town of Booneville. After this land was platted into new lots, the railroad offered each business in the “old town” a lot in the “new town.” The “new” city of Booneville was reincorporated in 1899, and when the Arkansas legislature divided Logan County into two judicial districts in 1901, voters chose Booneville as the site of the new courthouse. In 1910, the Arkansas Tuberculosis Sanatorium in Booneville admitted its first patient. The Sanatorium closed in 1973, when the facility began a new chapter as a center for adults with developmental disabilities. In 2006, members of the community formed the Booneville Historic Preservation Society (BHPS), and have since partnered with government and other entities in an effort to preserve the history and educate the public about the Sanatorium. By the end of that year, the facility was listed in the National Register of Historic Places. 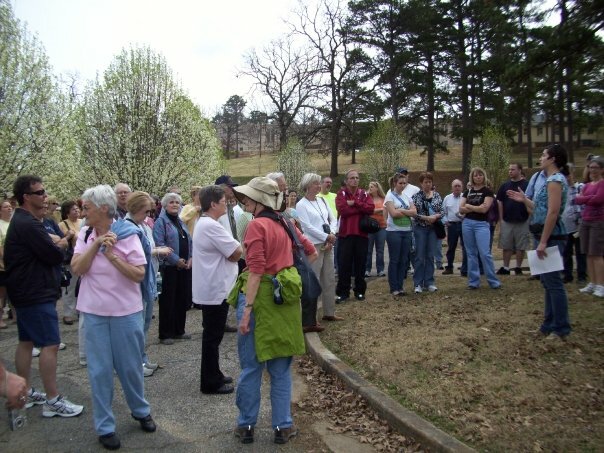 In 2006, the BHPS partnered with the Booneville Human Development Commission to host a reunion for patients, families, and staff of the Sanatorium. More than 130 people from five states attended the reunion. The BHPS also hosts tours of the facility, has developed presentations on its history, and has commissioned commemorative plaques to display at the Sanatorium. In 2008, the city of Booneville donated the old City Hall to the BHPS for use as an office. It will also display information and artifacts from the Sanatorium.